Corona (labeled Corona Extra) is a brand of pale lager owned and produced by Cerveceria Modelo in Mexico. This beer is available in over 150 countries and is the top-selling beer in Mexico and is one of the top selling beers worldwide. 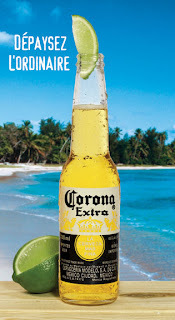 Outside of Mexico, Corona is often served with a wedge of citrus fruit, usually lime , occasionally lemon, inserted into the neck of the bottle. Within Mexico, especially in the south, Corona served with lime is not uncommon, but is not considered mandatory. This beer is basically bottled unlikely a famous Japanese beer,Ashai, which is canned. You can feel the taste of exotic Mexican taste first, but the sourness of Lemon lasts for a while as long as you have the beer with lemon which is quite common recipe for Corona. Corona always has impressive ads which we can feel being in a dessert island or being on holiday. Therefore, we can feel something special with Corona, the beer doesn't have deep taste and aroma though. Their light and soft taste is the reason why everyone doesn't hate Corona and everyone easily enjoys this. I know this is not the best beer of which I can think, but I would love to say this is one of the most enjoyable beers. For that reason, I recommend this beer for your parties! 우진~ 언제 우리 같이 마시자..